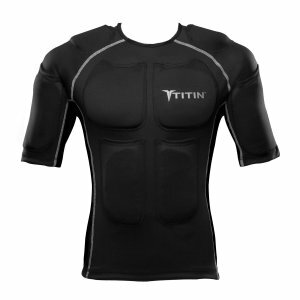 The TITIN Force Shirt is a compression shirt and weighted vest all rolled into one. This shirt comes with a 3-part weighted system that uses a zippered inner shirt with 8lbs of gel inserts and 14 pockets to choose from. What’s fantastic about these gels is that they can be heated or cooled and they’ll stay hot or frozen for over half an hour. The weight gels in this shirt will stay flexible even if they’ve been frozen so they will mold to your body. The gel inserts are located on the upper body and arms and are designed to affect the muscles while keeping strain off the joints. Studies have shown that using these inserts results in greater endurance, top end speed and strength. The latest technology has gone into this shirt to work on your muscles and give you the best workout possible. Even though 8lbs doesn’t sound like a lot it really will make all the difference to your workouts. When you’re working out you want to make sure that you’re not using a vest that will move around while exercising. The TITIN Force Shirt is great for workouts because of the combined compression shirt and the way the gel weights are flexible no matter what their temperature. The TITIN Force Shirt is more comfortable to wear than traditional weighted vests as it will hug your body. The breathable material will also keep you cool during a workout. You also have the option of freezing the gel weights before you begin. Fitness enthusiasts really love the TITIN Force Shirt and rate it 4.2 out of 5 stars. This is a top quality vest with compression shirt that comes with weighted gels that will last a lifetime. The compression shirt is also designed to last up to 10 years with regular use. Let’s have a look at what some customers are saying about this shirt. The TITIN Force Shirt is a great piece of equipment to have with you during your workouts. Being one of the better quality weighted vests to use it doesn’t come cheap. In fact it will cost you more than other vests but it also includes the compression shirt and the lifelong weighted gels that can be heated and frozen. 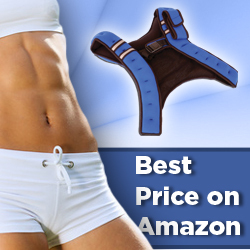 All in all if you want the best weighted shirt system then this is probably it. Click here to see the best prices for the TITIN Force Shirt.